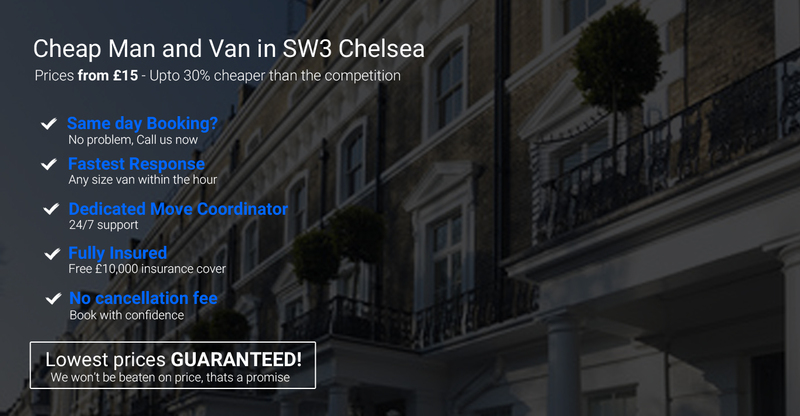 LOWEST PRICES GUARANTEED ON MAN WITH A VAN AND REMOVALS IN SW3 CHELSEA, FROM AS LITTLE AS £15 PER HOUR, UPTO 30% CHEAPER THAN THE COMPETITION + A LARGE FLEET OF FULLY INSURED VANS BACKED BY A DEDICATED TEAM OF PROFESSIONALS. Movevan Man and Van or Removals Services in SW3 Chelsea Branch covering all SW3 Postcodes is the best value, most flexible, fastest man and van service operating in London. We guarantee that we are the cheapest in SW3 Chelsea London and the surrounding local areas. The Areas We Cover in London range from South West London, South East London, East London, West London, North West London and North London. We charge by the hour for our man and van service in SW3 Chelsea, which means that you won’t pay for anything more than you need to. If necessary, we will send a job-specific surveyor out to give you an accurate quotation and we can provide as many men and vehicles as the job requires. We have a range of vehicles ready for any sized job, and we are open seven days a week.